Sullivan County board members of the Endless Mountains Heritage Region (EMHR) met at Ally Bell’s Restaurant on Route 220 in Dushore on Nov. 17. Participants of the think-tank gathering included (above, from left) EMHR Greenways Coordinator David Buck; EMHR Executive Director Annette Schultz; Sullivan County representatives John Krakoski, Karen Black, and Melanie Norton; County Commissioner Wylie Norton; and Endless Mountains Visitors Bureau director Jean Ruhf. 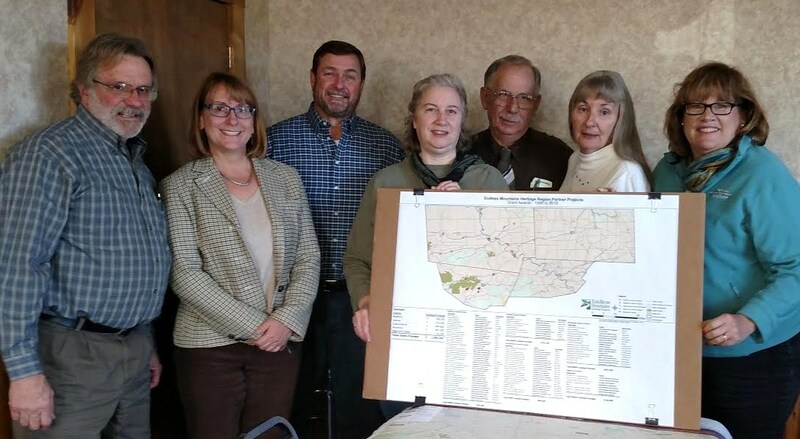 The second of four meetings planned by the Endless Mountains Heritage Region (EMHR) to provide a forum for discussion on heritage development on a county-by-county level was held in Dushore on Nov. 17. Sullivan County board members Wylie and Melanie Norton, John Krakoski, and Karen Black met with EMHR director Annette Schultz and geenway coordinator David Buck, as well as Jean Ruhf of the Endless Mountains Visitors Bureau, to identify issues that are specific to Sullivan County and to generate potential initiatives that could be included in EMHR’s 10-year strategic plan. Schultz stressed that heritage development involves activities that identify, protect, enhance and promote the historic, recreational, natural, cultural and scenic resources of a region or corridor and stimulate community sustainability and economic development through heritage, outdoor recreation and eco-tourism. Heritage initiatives involve the collection, conservation, interpretation and dissemination of the history and culture of places and the use of historic buildings, natural and recreational resources, cultural artifacts, and stories to enhance quality of life and attract appropriate tourism and industry. The community benefits of heritage development include environmental restoration, an enhanced sense of community pride, retention of young people, recruitment of light industry, economic development derived from tourism, expansion of recreational opportunities, and other quality of life improvements that foster optimism, sense of community, and a renewed sense of common purpose. Schultz’s one-hour meeting format was welcomed by participants who indicated that it helped them to stay focused on primary objectives while touching on a number of concerns. Similar meetings have been held recently in Towanda for Bradford County members and in Montrose for Susquehanna County members. Wyoming County members are slated to meet in Tunkhannock in early December.